I love watching and learning from your flute videos and I want to thank you for taking time to actually make them. Your passion for the flute is very inspiring. I just started learning the flute but I had to move after two lessons for my college studies. I was hoping if you could teach me (us) how to actually TUNE a flute ? Once again, thank you! J. That's a good beginner question. 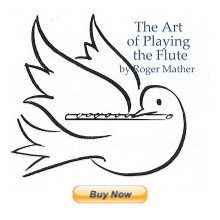 You'll find the basic beginner instructions for flute tuning are in this pdf article. A list for beginners who need to break down the basic steps of tuning a flute is below. 1. Check that the headjoint cork is in the right place using the cleaning rod's tick mark, lining it up with the center of the embouchure hole. If unsure about this practise, read about headjoint corks here. Pull out your headjoint 1/8 to 1/4 of an inch (the amount of headjoint draw will change millimeter by millimeter, especially as your tone quality and centeredness of tone develops. So stay flexible and experimental about the amount at first). Obtain your best possible tone quality over at least a month of focussed daily tone exercises(or a decade, why be stingy? hahhaa). You cannot skip this "finding a good tone" step. Tone is part and parcel of the tuning process. For example, flabby breathing, warbley flutey warbles, unsure embouchure (or a too tight embouchure) and/or possible whispy haunted house flute noises can not be played IN TUNE. Alternately, you can buy one of those $25 flat credit-card sized electronic tuners that sounds the 12 notes of the chromatic scale, and is calibrated for A440 etc. Get one that is also a metronome and tuner all in one. They're very useful. Also: Get your private flute teacher to help you spot-check your tone, dynamic range, breath support etc. Don't try and work in a vaccuum. Lessons each week get your ears and body skills all assembled for use. And playing duets with the teacher are even MORE valuable for understanding tone and tuning and how they relate. You will also find that as your playing style matures, you will eventually find one headjoint draw that seems to work 95% of the time, and can mark it with ink on the flute. In general, all these stages of flute tuning and flute tone develop go much much MUCH easier if done with a teacher. And, of course, it's an endless topic. This "learning to play in tune" stage of flute playing actually lasts for the rest of your flutey days. And, yes, there is no such thing as a flute that plays in tune just by blowing and pushing down keys. And just to make the study of "playing in tune" so vast we mere mortals cannot comprehend, every musical pitch is actually modified depending on its musical context. In fact every thing I know (and I still know nothing---as my father used to say....) about tuning a flute is written in my website's vast tuning articles page. Hope this helps. Happy summer holidays. Sorry I can't help. I don't have the facts or measurements to hands. I do know that it is because the air is warm that the pitch rises. When the air is cooler, soundwaves travel more slowly in the air, making the pitch flatter. Apparently it is not the expansion and contraction of the metal that causes the tuning changes in the flute when hot or cold, it is the rate that sound travels through hot or cold air. I'll look around for more information, but you might find more by googling "Coltman" "Physics of the Flute" "Hootz, hertz" at the British Flute Society web page, and other science pages. Quote from Nancy Toff: The Flute Book. ie: Why do cold flutes play flatter and warm flutes play sharper? Air temperature affects the pitch of wind instruments because of the difference in air weight that it causes; cold air is heavier than warm air. As temperature rises, the rate of molecular motion increases within the flute tube material, and so its density decreases and the pitch rises. The rise and fall of wind instrument pitch is thus parallel to that of the temperature----it rises as temperature rises and falls as temperature falls. Such deviations in pitch make it important for you to warm up your flute before performance, in order to bring it to "room temperature". Note that Toff says "wind instruments". Wooden string instruments respond to air temperature in the opposite direction. They go sharper when cold (not flatter like Flutes). Hi, my name is Sandra and I've been playing flute for quite a while now and I haven't really understood how you know if you're sharp or flat and how to make it better by turning the head joint away from you or in towards you, if you can please explain this to me. There are lots of "beginner tuning articles" at the top of this blog post. Thanks, excellent article. I always got confused about tuning my flute before this article. One thing I noticed is that you refer to your flute teacher a lot. What if your self taught without a teacher, as I am how can you help yourself to acquire the same sound on a REALLY old flute. I'm really glad you went into depth about the head joint cause that's what I was curious about the most. The reason I advocate having a flute teacher, is that like any sport, having a coach who can "spot" you leads to solutions alot faster than trying to "spot" yourself. You cannot see your physical flute playing habits in the round (from 360 degrees), and in the case of fine musical acoustics, like tone production and tuning, you cannot hear yourself with the experience that a teacher can. So you waste years and years struggling with simple, solvable problems, because you don't spot them. When you say "a really old flute" do you include "old but frequently repaired, and well-maintained" or do you mean like a flute built before 1920? Knowing details like that allows me to answer correctly. 1. Flute is built to an "old" scale. Has sharp C#s, and flat F and E, and notes are sharp and flat in non-measurable amounts due to where the holes are cut in the body. 1. Blowing harder and softer indescriminantly. Unaware of air speed changes, plays softly all the time, plays loudly all the time, plays loudly to make high notes come out and softly to make low notes come out. Solution: Take flute lessons; your teacher will teach you 'consistent air stream". 2. Poor posture which leads to lack of breath, leading to playing with "too slow" air stream. Solution: Take flute lessons; teacher will "spot" your postural idiosyncracies and teach you to self-correct to allow consistent air use. 3. Lack of listening deeply. Flutes naturally can be played out of tune unless player has the ears and the skills to hear this, and correct the out-of-tuneness. Solution: take flute lessons. The teacher will teach you to listen deeply and make simple corrections.